Within Del Webb Wilmington, residents have access to our new State of the Art Amenity center, and can enjoy activities and amenities from indoor and outdoor pools, walking trails, tennis and pickleball courts, and social clubs and volunteer organizations, plus flexible, open concept Inspired Design homes. Resident's also enjoy Wilmington’s newest master-planned riverside community, RiverLights. 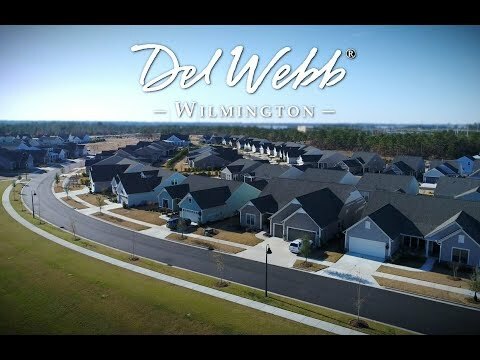 Explore Del Webb Wilmington so you can see the beautiful community and resort-style amenities. We believe you’ll like it here. The Taft Street lends itself to entertaining. Enjoy a warm gathering room, cozy den, and kitchen with backyard views. The Castle Rock’s floorplan with many gathering areas and private guest suite – plus a spacious kitchen and formal dining room – inspire you to entertain. The single-story Martin Ray offers a island kitchen, open dining and gathering areas, versatile flex space, and a huge pantry.